I have just been alerted by a number of friends and friends-of-the-blog about a really fascinating looking upcoming exhibition taking place later this year at an intriguing looking venue in Maastricht, The Netherlands. The exhibition, entitled "Hygiene, the Story of a Museum,"explores, as the press release describes, "the both fascinating and dramatic background of the notion hygiene" via an investigation into the history of a particular storied institution, the Deutsche Hygiene-Museum of Dresden, founded in 1911 by a mouthwash magnate. The exhibition uses this particular and important history as a launching-off point to explore questions about how the notion of hygiene changed "from a scientific concept into a global movement" and how it was "subsequently used by the National Socialism in Nazi-Germany and the socialism of the former DDR as an essential part of both ideologies." This exhibition will be on view from October 24th until January 30 at the Marres Centre for Contemporary Culture in Maastricht, The Netherlands, and was created in cooperation with the wonderful Dresden Hygiene Museum. Marres, centre for contemporary culture presents its fifth exhibition in the context of the long-term program on the notion of the Avant-garde: Hygiene, the story of a museum. The coming exhibition investigates the both fascinating and dramatic background of the notion hygiene. How did this word transform from a scientific concept into a global movement? How was it subsequently used by the National Socialism in Nazi-Germany and the socialism of the former DDR as an essential part of both ideologies? Hygiene, the story of a museum approaches these questions through the history of the Hygiene Museum in Dresden. Founded in 1911 by the inventor of Odol mouthwash, this museum still represents a unique position. The museum does not necessarily collect art or design, but has actively contributed to the awareness of diseases such as TB and cancer. Primarily, this museum has a social function—from information to prevention and education—and it presents the physical results of that function in the form of casts of skin conditions, promotional films and educational material, which have been produced and presented by this museum until 'Die Wende'. The museum had the ambition to 'reveal that which had hitherto been invisible'. Developing new exhibition models to reach broader audiences has been a primary point of interest, and the use of new technologies such as film has been of big importance in that ambition. The unique, social role of this a-historical museum and the specific attention for the exhibition as medium to make the invisible still visible makes the Hygiene Museum a fascinating subject. Especially for Marres, which has been investigating the role of the museum, the collection, the exhibition and the artist, and has attempted to address these questions through the development of new exhibition models for several years as well. Museum as Discourse focuses on 'making the invisible visible,' on striving towards transparency, which can be seen as a dominant ambition of the twentieth century. In Museum as Practice, the pedagogical strive for education on hygiene and the diffusion of scientific knowledge takes central place. Museum as Ideology offers insights into the meaning and the practical mission of hygiene in connection to the political and social-economical systems that characterize the Germany of the twentieth century. For press information, please contact: Floor Krooi. For more, visit the venue website by clicking here. 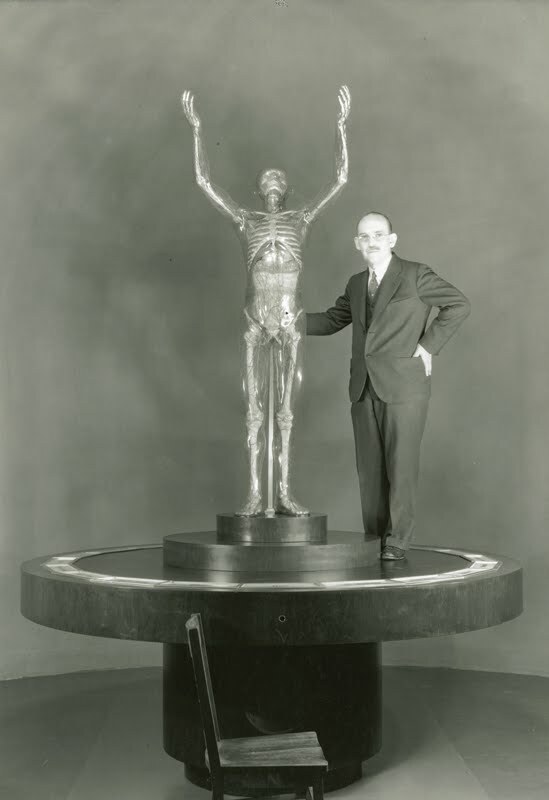 Image: "Glass Man in the Buffalo Museum of Science:" In 1935 the Buffalo Museum of Science purchased a “glass man” from the Deutsches Hygiene-Museum. In the late 1980s, officials at the Buffalo Museum returned it to Germany, regarding the object as tainted by its Nazi associations. German Historical Museum, Berlin; Via DMHD.